Comfortable weather. Evening temperatures in the 50’s is ideal for a gathering around an outdoor fire-pit. Daytime temperatures in the 60’s – perfect for golfing, biking, hiking, canoeing & kayaking. Even though many people take their vacations during the summer months, travelers will find that Wisconsin offers various attractions during all the four seasons. 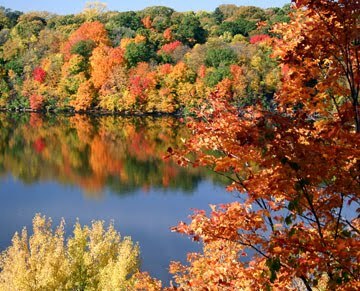 Those who vacation in Wisconsin during September and October will enjoy (‘colorama‘) incredible fall colors. All throughout Wisconsin, vacationers can find a variety of family fun activities: corn mazes, apple-picking, fun festivals, and more. There’s no better way to enjoy fall than in a vacation cabin, cottage, lodge, or home! · E-mail owners. Use the E-MAIL OWNER/MANAGER buttons. · Link to the owner’s official Website. If you contact any of our rental owners/managers, please mention RentWisconsinCabins.com. This entry was posted in Uncategorized and tagged fall, fall colors, travel, wisconsin. Bookmark the permalink.